Until the presidential election of 2000 conventional wisdom had it that a candidate that won the popular vote could not lose the electoral college vote yet Owl Gore beat GW Bush by over 500,000 popular votes but lost the presidency in the electoral college. Now it is true that the election of 2000 had many dominoes that had to fall perfectly into place for Bush to win the presidency like 1) Ralph Nader drawing almost 3-million votes (mostly away from Gore) & certainly more than 543 votes from Gore in Florida & 2) Pat Buchanan receiving a way oversized vote total in some very poor sections of Florida thanks to the butterfly ballot where many people thought they were voting for Gore but really cast their ballot for Pat. That type of electoral phenomenon is more rare than the recent dead heat in the Travers Stakes @ Saratoga. Many current polls show a very tight race between BO & Mitt based on the popular vote but the electoral college vote to keep an eye on is shown in the above chart (click on it to enlarge). You can see that if Mitt loses Florida he will have to "run the table" or that he is "drawing to an inside straight" in trying to win the electoral college & the presidency. In summary BO has more pathways to the presidency than Mitt does. Mitt's Virginia pathway is further complicated because former Virginia Republican Congressman Virgil Goode is running as the Constitutional Party's presidential candidate – Mitt cannot afford to have Goode take any of his potential votes. One comment by a reader that I recently posted approved of Mitt's strategy to date saying that he should save his push for the final sprint, when the general public starts to tune in thereby saving a big kick for the end. A problem with this strategy is that even before the first debate on October 3 North Carolina (60%), Wisconsin (20%), Iowa (35%), Florida (over 50%), & Ohio (25%) will have already started early voting. New Mexico (60%), Colorado (80%), & Nevada (65%) will have started early voting by mid October. The percentage figures listed by each state are the share of ballots cast before election day in 2008. Now you can assume that all of the early voters this year are not persuadable to change their votes but why would Mitt want to take this chance & not get started in earnest choosing instead to wait for the traditional election day of November 6 when over half of the votes will already have been cast in Florida where the election could be lost in & of itself. I also ask why would we want to take a chance of pinning our hopes solely on Mitt winning this election? Although BO now thinks WI is in play (thanks to the energy Ryan brought to Mitt's ticket) it is more important electorally that the big-money Republican Super PACs stopped running ads in MI & PA several weeks ago after spending millions of dollars earlier trying to help Mitt – this was not a good sign for McCain in 2008 when he pulled out & lost both of these two electorally rich states. A far more solid strategy is to start to build a strong base of resistance to socialism in both Houses of Congress regardless of who wins the presidency. To find such senate candidates click here to see the list that Jim DeMint is endorsing. I add to that list Florida senate candidate Connie Mack who is trailing his Democrat opponent badly. From the list – Josh Mandel in OH is in the worst shape & needs help. Two House candidates needing support are Anna Little in NJ & Steve King in IA. 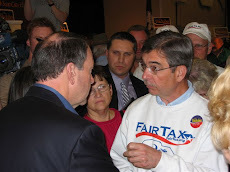 Both are FairTax supporters & Congressman King has already been attacked by his opponent for supporting the FairTax. King is in a tight race for reelection in a redrawn district. 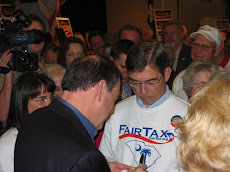 Anna Little would be a breakthrough as the first Congresswoman in NJ & the northeast to co-sponsor the FairTax. Both are first rate candidates who need help. The point is to help candidates who will make a difference whether they are from your community or state or not. Finding & working for the above type of people rather than concentrating on defeating BO, who Mitt very well might not defeat, will pay dividends in the long run as we set a strong base of patriots in office. We need to do much more than merely vote for Mitt & think our job is done – which of course it will be if that is all we do. If we all are not finding & changing the votes of two & preferably three people who plan to vote for statist candidates we may be in trouble just based on the raw numbers that show we are outnumbered. I know how hard many subscribers of this blog are working in this regard for America. I specifically do not recommend asking people to support Mitt because your credibility will be sorely tested if not destroyed if he wins & then disappoints. In fact you may be severely questioned just for recommending him to anyone who is familiar with his record. The above position does not mean we are giving away the presidential election – that may have already been done by the establishment Republican Party. Following the above strategy & winning a majority with real constitutional leaders in the Senate while holding on to the House (& replacing the current poor leadership) will make BO's second term much more difficult for him & will minimize the damage he can do. strategy described above is not fool-proof as the population ages & our youth knows nothing of our wonderful heritage & is content to mindlessly just spend down the family wealth – leaving the next generation to rebuild it, if possible. Having Mitt win or BO win a second term is a loser - either way. Doug - Can I assume you are ruling out being swept into office on Mitt’s coattails? I was disheartened by your last sentence, “. . . our youth knows nothing of our wonderful heritage”. As usual "conventional wisdom" and the truth are not always on the same ticket. Andrew Jackson, Samuel Tilden, Grover Cleveland and Gore all won the popular vote but lost the election. Personally I would like to see us get rid of the electoral college. It served a valid purpose in the early days of the Republic but the reasons for it then are now long past. I would love to see a vote in Montana have the same value as a vote in California. Also picture all those Dems such as Nancy Pelosi who demanded getting rid of the electoral college. Lets call their bluff. It would be great to watch Nancy and the gang backtrack once they (big blue state Democrats) realize their power will be stripped. RTE - the conventional wisdom in the Gore case was based on 108 years of the popular vote & electoral college vote producing the same winner. Also, Montana (3 electoral votes) has a bigger impact on the electoral college than California (55 electoral votes) has based on percentage of electoral votes (538 total). California would have a bigger impact than Montana based on a popular vote election. Doug - BO election even if Republicans continue to hold House will increase probability of a dollar collapse compared to a Romney win. Why? BO will increase debt to GDP ratio faster by growing the welfare state and restrict gas and oil drilling. Mitt will Decrease debt growth by significantly expanding gas and oil drilling and decreasing trade deficit. The drilling will also boost GDP by 1 to 2% and create 1-2 million jobs per year energy related. Our foreign creditors know this. I am on record predicting dollar collapse by end of 2014 if BO is still president. That event may change our daily lives drastically. Vote Mitt else 2016 election will not be very meaningful.